On January 29, 2013, the Gragg Building received the ULI-Houston Development of Distinction People’s Choice Heritage Award for the renovation project for this architecturally and historically significant building. The update has turned this 1956 building into a state of the art, LEED Gold Certified office complex for a major city department. Gragg Park sits in the pleasant shade of moss-draped oaks at the intersection of South Wayside Drive and Wheeler Street. It is not large by the standards of, say, Memorial Park, but it has spacious lawns and picnic tables under the trees, and a ball field invites players. On the edge of the park, facing onto South Wayside, is an office building made of intriguingly green stone. It is the home office of the Parks and Recreation Department, but its long history involved astronauts and space scientists before the horticulturists and groundskeepers moved in. In 1956, the post-World War II boom was in full swing. American families were busily making up for lost time, setting up spotless suburban households and filling them with babies and shiny modern conveniences. Businesses were making the most of freewheeling international trade and abundant domestic consumer dollars. Construction was rampant. A construction firm based in Houston, chose the trend-setting architectural firm MacKie & Kamrath to design its new corporate home. It was to be built on 46-acres of undeveloped land near that automotive marvel, the Gulf Freeway, in the midst of the suburbia popping up around those ultra-modern shopping destinations, Gulfgate Shopping City and Palms Center. The building they came up with was everything new and exciting about architecture in the '50's. It consisted of sleek horizontal lines Frank Lloyd Wright would have envied, some at surprisingly jaunty angles. 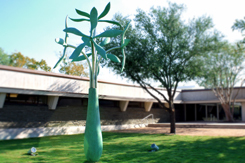 It was built with air conditioning and walls of glass looking out on a lush interior courtyard. And, the stonework was green. Construction was completed in 1956. 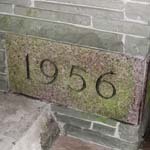 In 1961, the green stone building was bought as a real estate investment by W.D. York and Gragg Drilling Company. The astronauts moved in during 1962. 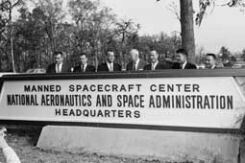 The National Aeronautics and Space Administration, dedicated to beating the Soviet Union to the moon, was transferred to Houston from Langley Air Force Base in Virginia, and it set up shop in the Gragg Building. The Mercury Program was already underway, having sent 2 men into space and back again in 1961, and in February 1962 John Glenn proved that Earth orbit was a practical goal. The rest of the Mercury flights were planned by the engineers and scientists at the Gragg Building. Houston was wild with pride and excitement. The future was ours, and the whole world knew it! We were Space City, USA! We were the epicenter from which scientific discovery radiated! Unfortunately, the Gragg Building didn't have the necessary office space for that much science. Additional offices were leased all over town. As NASA geared up for the next phase of the space race, the Gemini Program, work progressed on a huge office complex that would become its permanent home, the Johnson Space Center at Clear Lake. They moved there in 1964. In the ensuing years, several fine companies leased space in the green stone building. W.D. York and Gragg Drilling purchased 11-acres farther down Wheeler toward Telephone Road. In 1976, 30 years after it was built, the Gragg Building was bought by the City of Houston, and the surrounding acreage was donated to the Parks Board by O.L. Gragg and his family for use as a park. That property became Gragg Park when it was transferred to the City, and the Parks and Recreation Department moved in January 1977. In 2000, the 11 additional acres were purchased by the city and their development is being planned. The Interstate 610 South Loop was built down the road, and, mercifully, the original stretch of the Gulf Freeway was totally rebuilt in the '70's. Gulfgate and Palms Center have seen massive redevelopment. But the green stone building stands serenely in Gragg Park, a monument to another age. On October 5, 2006, the Parks and Recreation Department honored the 50th anniversary of the Gragg Building with a day of celebration and reflection. Representatives of NASA and the Gragg family attended, as did Mayor Bill White and District I Council Member Carol Alvarado, present and former HPARD staff members, and authorities on Houston architecture. Unlike many buildings that have stood for so many years, the Gragg Building had not suffered from ill-advised modernization, but it did bear some nicks and dings from long use, and its wiring, insulation, plumbing and air conditioning were long out of date. A renovation was planned by Harrison Kornberg Architects, which has resulted in bringing the old building up to date with LEED specifications while maintaining many of its original design elements and the sleek, modern feel it had when it was new. This architectural gem has been brought back to mint condition. In addition, a maintenance building elsewhere in the park has been rebuilt to house the Recreation and Wellness Division, adding greatly to the utility of the Gragg Park Campus for the staff and the citizens of Houston. 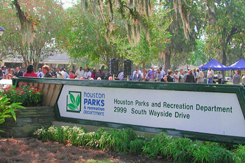 The Houston Parks and Recreation Department was in temporary quarters for the duration of this project, and moved back to the Gragg Park Campus in November 2009. On December 8, 2009, a re-dedication of the Gragg Building as HPARD headquarters honored the efforts of the architects and the contractors and celebrated the local, state, and national historic designations it has obtained. The National Registry of Historic Places has listed the Gragg Building, and Mayor Bill White and First Lady Andrea White celebrated the Gragg Building’s LEED Silver Certification at the event. 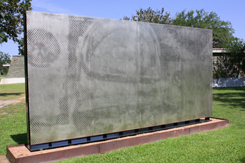 On Thursday, November 18, 2010, the City of Houston unveiled a new addition to the Houston Municipal Art Collection. “Standing Vase with Five Flowers” was installed at the Gragg Building, H.P.A.R.D.’s headquarters, where it will be on permanent display. Artist James Surls was an honored guest at a festive unveiling attended by Mayor Annise Parker and other city officials and art community luminaries. 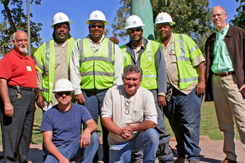 On October 15, 2012, Gragg Park was the location for the unveiling of a new art display. 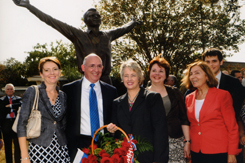 The Yuri A. Gagarin Statue, which honors the Soviet cosmonaut who was the first human in space, and the John H. Glenn, Jr., Panel, a two-dimensional visual display of the American astronaut who was the first human to orbit the Earth, were unveiled to the cheers of an appreciative crowd, including members of the Gagarin family, the Honorable Alexander Zakharov, the Consul General of the Russian Federation, Michael L. Coats, the Director of the NASA Johnson Space Center, representatives of the Russkiy Mir Foundation, which funded the Gagarin statue, representatives of the Houston Arts Alliance, the Mayor’s Office of Cultural Affairs, the artists and fabricators of the Glenn display, and an enthusiastic group of art lovers and supporters of international relations.